In the Orlando area are hundreds of hotels to stay at, to enjoy your holiday and have a good rest between all the activities during your holiday. These hotels vary from budget hotels to deluxe hotels and resorts. Most of the Orlando theme parks also have their own themed resorts, for the true fans. If you want to see the best hotels for a specific area, you can for example use TripAdvisor. Check the most favorite hotels and motels for Orlando and Kissimmee (click to open TripAdvisor). For tourists and visitors without transportation, I would recommend a hotel on or near International Drive or one of the theme park hotels. That way you are close to the theme parks and shops. Most of those hotels have a shuttle service to the theme parks and shopping malls, though the hotels further away would probably go there twice a day. 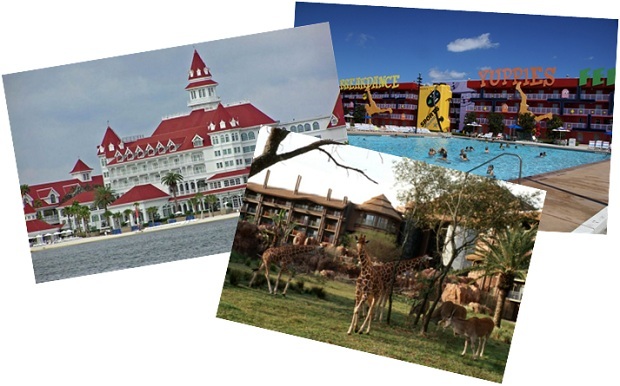 These are the on-site accommodations you can find at Disney World Florida. Varying from budget to deluxe there is something for everyone. There are also some timeshare locations, but I won't share these on the website. I don't like the way time shares are presented to tourists in general so I won't support it. 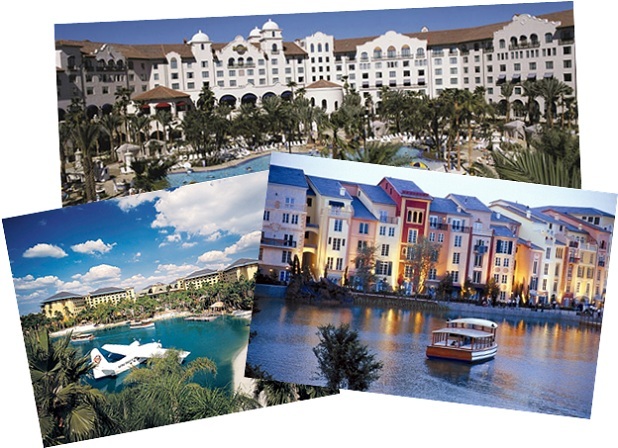 Loews Portofino Bay Hotel (theme: Italian), this resort also has villas on-site. Some of the hotels have exclusive benefits, for example a room key which also functions as an Express Pass in the Universal theme parks. This means you can skip the lines and reach the end of the line a bit quicker. Another benefit is early admission to the Wizarding World of Harry Potter. If you are on a tight budget, or you just don't want to spend a lot of money for a place to stay, you can also choose one of the many motels in the area. They don't cost much, most of them have a pool and a lot even offer free WiFi. Why spend much money on a hotel or villa, if you spend all day in the parks or doing other things? You just need a place to sleep, that is clean and safe. The rest of the money can be spent on theme parks, shopping, restaurants and did I mention shopping already? You will find the motels on most through roads, signs will tell you if there are vacancies. You can check TripAdvisor for reviews about motels. Read them with a grain of salt. Not all is true, but if you read a few comments, you will figure out wether it's good for you or not.